One of the Closest Hotels to Pearson International Airport (YYZ) and The Airport Corporate West Business park in Mississauga. 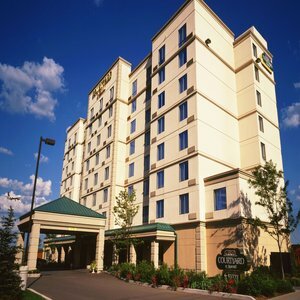 Courtyard by Marriott Toronto Airport offers an excellent access point to all area attractions including Woodbine Race track and Casino, Royal Woodbine Golf, Niagara Falls, Paramount Canada's Wonderland, Playdium and Wild Water Kingdom. We are located minutes from local corporate head offices including Fedex, Samsung, HP, CitiGroup, Bell, and TD Bank. Each room has FREE high speed wireless Internet. Take advantage of our complimentary 24 hour airport shuttle. Unwind in our bright and spacious pool and fitness centre. The Bistro provides high quality freshly prepared meals and beverages in a quick serve environment. The Bistro offers a variety of appetizers, sandwiches, hot meals, entrÃ©e salads and soups. Perfect for business and fun, our friendly staff will ensure you have a great stay!